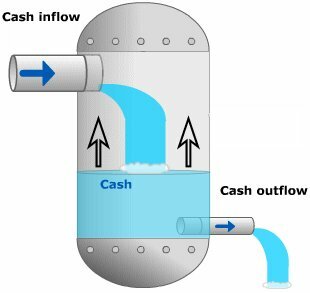 THE CASH FLOW STATEMENT (or Statement of Cash Flows) is organized into three parts. The first, cash from operating activities, can alert one to future declines in sales and earnings by signaling when a company is having trouble selling inventory or collecting cash it is owed, among other things. The second, cash from investing activities, gives the reader lots of information from how much the company earned in the stock market to whether it's cutting back on capital expenditures. The third part, cash from financing activities, indicates whether a company receives cash infusions from outsiders, such as banks or shareholders. IDEALLY, a company's operations should generate excess cash, while its investing and financing sections show negative cash flows because self-sustaining businesses can pay down debt and finance new investments internally. TO UNDERSTAND how the cash flow statement highlights earnings quality, one must understand the accounting rules that govern the cash flow and income statements. Generally, companies record the revenue that drives earnings when customers receive merchandise, but before they pay. The cash flow statement reflects how much cash is actually collected. A BELLWETHER FOR EARNINGS quality is the ratio of net income on the income statement to "cash from operating activities" on the cash flow statement - generally, the closer the ratio of those two numbers is to one, the higher is the quality of reported earnings.